All of our patients are all directed to complete this Systems Survey as a part of their initial evaluation. You can take it too, and we will e-mail you your health score. We will do our best to accommodate your busy schedule. Contact us TODAY to schedule an appointment! Our friendly staff welcomes you. View VIDEOS of our patient testimonials plus topical discussions on health related issues. 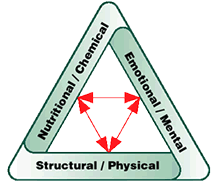 The triangle represents the basic elements that make up the basis for your state of Health. It is the guiding principle of our practice. Each individual side of the triangle affects the other two sides, and so our goal is to bring all three sides into optimal balance. Structural / Physical – relates to the importance of maintaining integrity of body balance and physical functionality. Nutritional / Chemical – relates to the importance of fueling the body with correct nutrients and with protecting the body from toxic substances. Emotional / Mental – relates to the inseparable mind-body connection. Our office atmosphere is like “one big hug” that permeates from the caring nature of Dr. Rehrig and his staff. To help as many people as possible lead healthier and happier lives through a natural and holistic approach to their health and well being. Please Note: If you are new to seeing a chiropractor and want to find out more, or even if you are already seeing a chiropractor for your adjustments but you are looking for MORE, please email us or call 610-566-9040 to receive personalized answers to your questions from our friendly team.